Green veggies…we need them. But we don’t always get enough through our meals alone. Perhaps this is why you’re looking toward a juicer to help you maximize the green stuff. Well, you’re in luck as we have put the hard yards into finding out which juicers are best for extracting the goodness from your greens. We do get a bit technical with words like “masticating” and “centrifugal”, but if you’re in the market for a juicer you’ll be familiar. If not? We’ll make sure you’re up to date. What kind of juicer is best for greens? What makes a juicer efficient for juicing greens? Are there affordable options out there? What’s the difference between centrifugal and masticating, and which is best? Let’s figure this thing out. 1 What are the different Kinds Of Greens and which greens are better for juicing? 2 How To Juice Leafy Greens? 3 What types of juicers are best suited to leafy greens? 4 What are the best vegetable juicers by type? 5 What are the best juicers for greens by Brand? 6 What are the best inexpensive juicers for greens (under $100-$150)? What are the different Kinds Of Greens and which greens are better for juicing? There are many kinds of greens out there, some more popular than others. Here’s a little tutorial on the different kinds of greens, their families and whether or not they’re suitable for juicing. These are the more “watery” greens such as cucumber from the gourd group, and lettuce from the daisy family. Squash varieties such as courgettes and marrows are also more watery greens which soften upon cooking but aren’t so great for juicing. However, cucumber and lettuce are fine for juicing as they add lots of moisture and nutrients but don’t overpower with taste. The brassica/cruciferous family has members such as kale, collard greens, broccoli, Brussels sprouts and cabbage. I generally stay away from juicing veggies like broccoli and cabbage as they can be a bit harsh on the tummy. It’s also been found that large amounts of cruciferous veggies can have an adverse effect on thyroid function. However, this is argued as it is also said that you’d have to eat an awful lot of raw cruciferous veggies to have any kind of negative response. Spinach and celery are fabulous for juicing as they are full of vitamins and pack your gut with good things when juiced thoroughly and kept cool. Fennel and other herbs such as dandelion can also be wonderful additions to your green juices, as they have lots of therapeutic properties to help with all things from liver issues to digestion. If you’re ever unsure if a particular green is safe or suitable for juicing, a quick online search is always a good idea. How To Juice Leafy Greens? It depends on which type of juicer you are using, but it’s all pretty much the same process. Pop the greens in…marvel at the juice pour out and discard the pulp. What types of juicers are best suited to leafy greens? Greens are full of exceptional goodness, but they generally lack in juice and flesh like what we expect from an orange or apple. This means we need a juicer which is up to the job of eking out the last drops of nutrition from less yielding plants. Masticating juicers, slow juicers and cold press juicers are all basically the same thing. They follow the philosophy that juice must be slowly pressed from the source, without adding any corrosive heat which can ruin nutrients. Masticating juicers generally have an auger which presses and chews the greens against blades and mesh plates to get the juice and nutrition out of the greens. 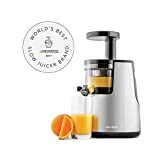 It’s argued that masticating juicers are better than centrifugal juicers because they squeeze more goodness out of the ingredients with their slow and steady process (generally running from 60 to 120 rpm). They extract more minerals and enzymes, and often more juice, while keeping the juice cool to preserve all the goodness. Centrifugal juicers chop the greens and spin them at a really high speed to whip the juice from the hard material. There are arguments that centrifugal juicers can actually deplete the juice of some nutrients as it can heat up slightly due to the speed of spinning. That’s why slow-juicers (like masticating juicers and cold press juicers) are very popular among the health-conscious. I’m going to go ahead and say masticating or slow juicers are best for greens because they get the most out of the ingredients they’re faced with. If you’re going to juice greens, you want to get the very best nutrition you can…that’s the whole point, right? There are other aspects to consider such as: the cleaning process, the size of juice jug and pulp jug, the weight, dimensions and color. But we will touch on those points as we move through the best juicers in the biz. What are the best vegetable juicers by type? 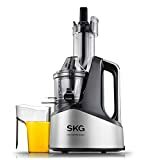 A slightly lesser-known juicer, the SKG deserves a spot on the list for a few key reasons. It’s very well made with TRITAN food-grate materials for longevity. It has a slow motor for masticating greens as slowly as possible to ensure maximum juice and minimal pulp. LOW SPEED MINIMAL OXIDATION MASTICATING JUICER-Top Quality 240W AC motor with low speed of 43 RPMs. A few niggles customers have had are that it could be a bit quieter and easier to clean, but the juice itself gets 5 stars all round. The Omega VRT350 is a compact masticating juicer which sits inconspicuously on your bench top. It has a nice low speed of 80 rpm to grind the goodness from your greens without corrupting the enzymes with heat. It has a “reverse” function which comes in handy if you get any clogs or blockages. It’s a great little machine for greens because it’s especially designed for maximum juice and very dry pulp. If you can get it on special the price isn’t too bad, otherwise it’s around $400 give or take. Centrifugal juicers spin the ingredients around at a super fast rate which causes the juice to separate from the solids (i.e. the pulp). It’s a very rapid process and is a lot more fast and furious than the masticating process we looked at above. The Cuisinart CJE1000 is a simple juicer with a powerful 1000-watt motor which is more than enough for efficient green juicing. It has a sturdy, durable construction and nice touches such as an adjustable flow spout and 5-speed dial. If you’re after a simple centrifugal juicer for juicing greens, and your budget is modest, this could be the one. (The price sits at around $120). The Kuvings NJ-9500U is a simple machine with a surprising ability to get the best out of greens. I say surprising because it runs on 350 watts which seems measly compared to the Cuisinart. All it means is that you can’t go crazy with multiple batches of juice, but will be 100% fine with a modest serving of green juice. For how great the BJE510XL is, the price is pretty great at around $180 (give or take depending on where you buy it). It has a powerful motor with 900 watts to easily churn through hard green veggies. It’s an attractive, sleek model with a long-lasting stainless steel body. Slow juicers, cold press juicers and masticating juicers do pretty much the same thing. They extract juice and nutrients by way of a slow, grinding process as opposed to rapid spinning and subsequent heat. The Hurom Elite is a very slow juicer indeed, at 43 rpm. The greens are crushed by the auger into a tough-as-nails stainer where the juices are thoroughly extracted. This makes it ideal for greens as they need a slow, hard and concentrated grind to get the maximum juice. If pretty colors are your thing, you’re in luck as it comes in some nice shades like wine. It’s a little spendy, at around $400 (don’t take my word for it as prices do tend to change). This is a pretty cool-looking juicer with a red body and black accents. It has a maximum speed of 80 rpm which makes it efficient at grinding the juice out of fibrous greens and preserving the nutrients. This is a little faster than some other masticating juicers, but slow enough to keep cool. Some people have noted that this juicer does require some of the tougher greens to be cut into smaller pieces in order to get the best results. 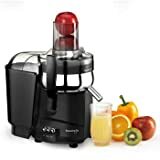 Cold press juicers are masticating juicers which are designed especially to keep the juice cool to ensure the enzymes stay alive until they reach your body. These are the best ones out there, as of now. The Tribest is a well-made cold press juicer with a mind-blowing 12-year warranty. Tribest boasts a very high extraction of nutrients with the 5050 compared to other cold press juicers. The inner workings have been designed to act like human teeth (the ultimate green-chewing devices), with stainless-steel gears. Tougher, stringier veggies like celery and kale are handled easily by the tough, sharp gears. This is a pricier model, generally sitting around ($500). A slightly lesser-known juicer than the likes of Omega, Breville and Hamilton Beach. 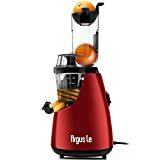 The Argus Le gets a spot on the list because it is reasonably priced, it is very highly rated and it has a patented auger which promises a 90% juice yield. It also has a “sorbet” filter (which isn’t really green-related but I thought it was pretty cool). Customers have found that they can juice just about anything with this guy, even tough, stringy greens. What are the best juicers for greens by Brand? Breville and Omega are frontrunners in the kitchen appliance world, including juicers. To save you trawling their catalogues, we’ve picked their best juicers. There are many Breville juicers with impressive features and high ratings. But when it comes to greens, a little more care needs to be taken to find the right one. 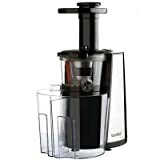 For example, the BJE200-XL is extremely popular, highly-rated and raved about, but it’s a centrifugal juicer. It’s not as ideal for greens as it is for juicier fruits and veggies. So which is best? We’ve gone for the BJS600XL because it is a masticating juicer which is by far the best choice for juicing greens if your budget allows. It’s designed for harder, tougher veggies such as carrots, wheatgrass and gristly greens. It’s also designed to let more of the fiber into the juice than other juicers, which is great for greens as the fiber is a shame to waste. Some people have commented that the clean-up process could be easier as it does take a little more time that desired. Now, it is proving a little hard to source as it’s sold out or unavailable at a few places as of now, but it should come back soon. You can’t really go wrong with the Omega J8006, it’s up there with the very best of the best. It uses a slow grind and a powerful two-horsepower motor to mash the life out of the hardest of greens. It’s super versatile too, so when you’re not guzzling green juices you can make nut butters, grind coffee and make soft foods like baby food. Definitely a front-runner if you’re getting serious about juicing your greens on a regular basis. What are the best inexpensive juicers for greens (under $100-$150)? A bargain will make your juice taste even sweeter. Not really, but you get the gist. The thing is, the cheapest juicers are generally centrifugal. This isn’t so bad, as there are some great ones out there. It just means that you might be compromising on some of the nutrients from your greens. But sometimes a really low price tag means giving up a few features. Hamilton Beach are great at supplying consumers with affordable, high-quality appliances. Now, the 67608A Juicer is a centrifugal juicer which may seem contradictory to the “masticating juicers are best” talk. But, the price ($70 at the most) and convenience lets it pass. It has a really large chute so you can chuck whole fruits and veggies in without having to pre-chop. Clean-up is easy as you can just pop the parts into the dishwasher or use the included cleaning brush to give them a quick manual clean. This is a great choice for people with small budgets and very little time on their hands. It’s ideal for people who want to make a juice with a mixture of juicier fruits with added greens for nutrition as opposed to all-out, full-green health juices. Breville BJE200XL is a super popular model with a tidy, compact design for easy storage and modest countertop usage. 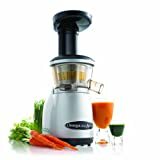 It is a centrifugal juicer, but it has an extremely hard and sturdy extractor made of titanium-reinforced stainless steel to get the most out of greens and fruits. Plenty of customers have reported their glee at how well this model juices their greens. You can get it for under $150 and sometimes even $100. A great juicer for people with little time but who want the most juice out of their greens without investing in a masticating juicer. Hopefully you’re feeling armed with info to help you choose a juicer for your greens. As you can tell, it’s quite confusing out there, with all the different brands, terminology and promises. Just ensure you’re choosing a juicer with a strong construction, a decent wattage, a slow grind (for masticating juicers) and an easy-clean design. 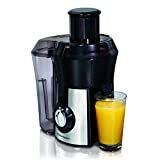 Anything from Omega is not going to disappoint, or for a cheaper option take a closer look at the Hamilton Beach 67608A Juicer. Good luck and happy juicing. Read Next: What Are The Best Juicers for Beginners in 2018?